Pop. 239. 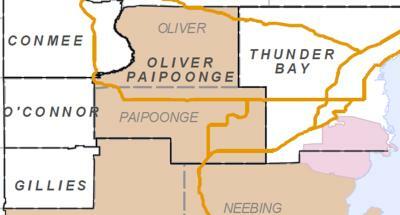 In Oliver T., Thunder Bay Dist., 32 km. W of Thunder Bay. The post office was established as Murillo Station in 1880, but 'station' was soon dropped and the name now is officially Murillo. Pop. 290. In Oliver and Conmee Ts. in Thunder Bay Dist. on the Kaministikwia R. and Hwys 11 & 17 & 590, 22 km. W of Thunder Bay. Pop. 100. In Cooke T, Thunder Bay Dist., 1 km E of Hwy. 61, 33 km SW of Thunder Bay, 18 km NE of the Minnesota border. In 1858 the place was called Harbour Bay. In 1936 the name Cloud Bay was approved. Pop. 10. In Forbes T., Thunder Bay Dist. on Hwys. 11 & 17,44 km NW of Thunder Bay. Pop. 600. 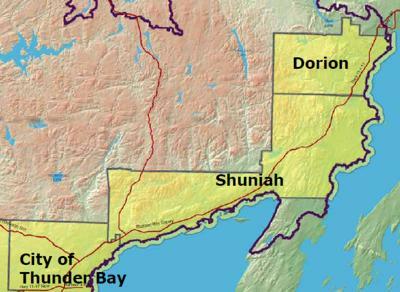 In Gorham T., Thunder Bay Dist.on Hwys 589&591, 19 km N of Thunder Bay. The post office was established as Lappe in 1936. The history of the community and the origin of its name have not been recorded. Pop. 40. In Goldie T., Thunder Bay Dist. at the junction of Hwys 11 & 17, 49 km. NW of Thunder Bay. Pop. 100. 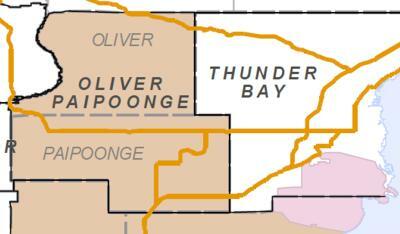 In MacGregor T., Thunder Bay Dist. on Hwy 11 & 17, just E of Thunder Bay. 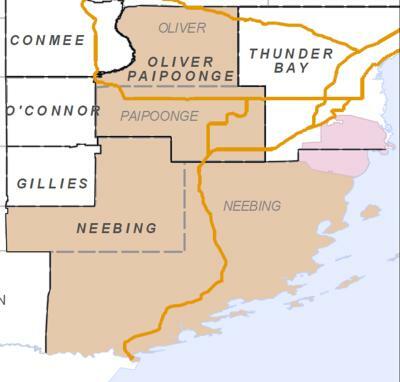 The name was approved by the Canadian Board of Geographic Names in 1955.